Do you know that the food you're buying is really "organic"? 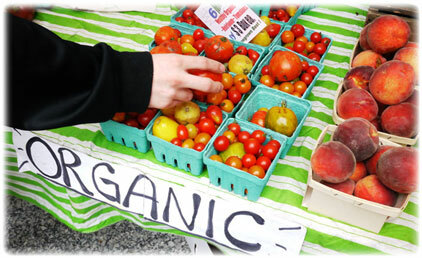 Several local food suppliers are selling food as "organic" when in fact it's not. The word "organic" is a regulated word. It's a bit like "Medical Doctor" --- the term is regulated. Or, to put things more simply, it's like the words "ounce" or "gram" or "pound" --- the words have a standardized meaning. The only ones that can call their products "organic" are those which comply with the "Canadian Organic Standards" and are certified by an independent certification organization. Yet there are some local food suppliers who are deliberately calling their products "organic" even though they are not. False claims. If a product is truly organic, it will usually have a sticker-logo like one of these on it. We came across this recently with a local supplier, who made liberal use of the word "organic" even though we know they are not certified, nor are certain of their suppliers. Why am I writing about this? Because they're undermining the credibility of the organic industry. If consumers can't trust the word "organic" then the movement will ultimately fail. Farms that truly are certified organic spend lots of money to get the certification --- it doesn't come easily, and it's not cheap. The requirements are stringent, and the certification process is intensive. As it should be. Is "organic" the be-all-end-all? Hardly. But it's a start, and it's currently the only way consumers can be assured that their food isn't contaminated by transgenic organisms (GMO). How can you know for sure something is really organic? You ask the seller this: Which organization certified this product as organic? (For us, we're certified by FVOPA --- Fraser Valley Organic Producers Association). They should have an answer if they are legitimate. "Are you sure these are organic?" "But it doesn't say which organization certified them." "Oh, I know they're certified." "Can you tell us who they're certified by?" At that point we knew it was probably a scam. The same thing happens frequently at farmer's markets and with local "organic" delivery services, where the risk of being detected is quite low. "Well, we're not technically certified yet. We're in third year transition." OK, that's nice that he's in third-year transition, but it's not organic yet, meaning his sign is false. We didn't buy his produce. We're not saying that non-organic food is always bad. But we are saying that if you buy organic produce, remember to make sure there's proof that it's actually certified. If there's no proof, it's probably not really organic, and you are probably wasting good money.